GeniPulse is best suited for small, medium and large sized hospitals with 5 to 800 bed capacity. A comprehensive hospital information management solution with an installed option. Modules include EMR, IPD, OPD,Billing,Bed Management, Inventory , Patient management and more. Free to use for 6 months. This software is running in our hospital last 5 years. Company provides time to time update. Pros: Overall Quality: -We never face any challenges to operate this software. Overall quality is good. Ease of use: - Very user friendly, even a person with little computer knowledge can operate. Features & functionality: We have used two software before this, but this software is fantastic. Most important this software covers end to end functionality. OPD, appointment, IPD, Laboratory, Radiology are main modules in any hospital and this software has in-depth coverage of each module. Pictorial view of Bed management and calendar view of doctor appointment is good. 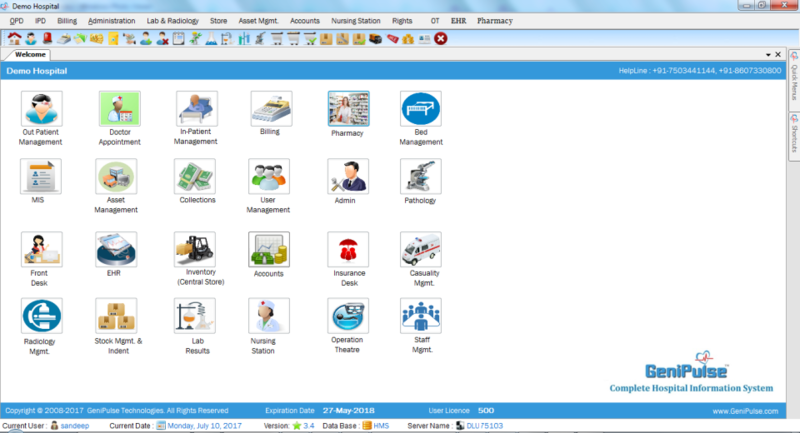 Most hospital software has limited Pharmacy functionality but it covers all day to day pharmacy operations. Electronic health record trends are very useful for doctors. Customer Support: Good even team supports on Sunday as well. Value for money I don't think you will find such extensive solution with the cost, this company is offering. Thanks for providing this amazing solution. Cons: 1. This software does not have Blood bank module, we had purchase blood bank from outside vendor, but blood bank billing can be done from this software. 2. Initially reports were taking time to load but later company have optimised most of the reports and improved performance. 3. This software does not have IVF module. Thanks Gourav for your feedback. We will definitely include Blood bank & IVF Module in the coming releases. Thanks surender for providing review. Please provide only those menus to the user which he is using. You can do this in rights management. Please get in touch with our customer care for any help.